As part of their Leadership rotation, 9th-grade Service Learning students work in small groups to design and assemble balance bikes for preschoolers. 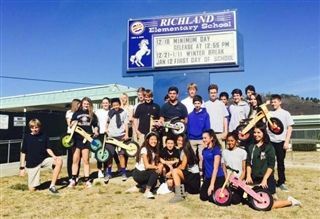 Last week, students personally delivered five completed bikes to children at Richland Elementary School, an Education Enrichment Systems (EES) school in San Marcos. In October, a group of freshman donated five bikes to EES's David and Jillian Gilmour Early Education Campus in Vista.